The Philippines is no stranger to typhoons, but Typhoon Mangkhut, known locally as Ompong, was the strongest tropical cyclone to enter the Philippines this year. In fact, Mangkhut was the strongest typhoon in the world this year, only slightly weaker than Typhoon Haiyan, which devastated the city of Tacloban in Eastern Visayas in 2013. Before Mangkhut made landfall, my mother and I followed weather updates, stocked up on food and braced for the storm. In a nation like the Philippines, which constantly gets battered by typhoons during the monsoon season, one learns how to live with the dangers that a tropical storm can bring. We comforted ourselves with memories of past storms, telling ourselves that we’d previously survived flooded streets and power outages left in their wake. We were also better placed to weather Mangkhut than many others. We had a sturdy house, built by my Lolo (grandfather) Andoy after he moved to Baguio from the Ilocos Region in northwestern Luzon. The city was booming, partly thanks to the gold being extracted from the mountains surrounding it. My grandfather didn’t work in the mines; he first drove a jeepney, then a taxi. Reaping the many benefits of a flourishing economy, he eventually went on to own a fleet of taxis and sent all his daughters to university. My grandfather’s good fortune meant that my family has since been far removed from poverty. The house kept us safe as the typhoon raged on in the early hours of 15 September. I awoke at about two in the morning to the sound of the wind whistling and objects crashing outside. There was a loud bang—a living room window had blown open, and my mother rushed from her bedroom shut it. We slept fitfully. The next day, we waited for the storm to ease; although we were afraid, we knew we would be safe. When the power came back on that evening, we charged our phones, and responded to messages from friends and relatives, telling them we were safe. We’d been temporarily cut off from the world, and had no idea of the extent of Typhoon Mangkhut’s destruction. As we caught up on our social media feeds, it became clear that something dreadful had happened near our city. An entire mountainside had collapsed in a massive landslide. Almost a hundred people in a village called Ucab were feared dead. My mother and I looked at each other in disbelief. So it was that Ucab, whose name had once been a source of jokes in our family, simply because no one among us knew where it was. I first learned to take a jeepney by myself when I was thirteen years old. I was taking baby steps to adulthood, and my mother or father would accompany me to the jeepney stop at the top of the hill near our house and wait until I was safely ensconced in a vehicle headed to my high school. The jeeps I usually took had “Plaza-Liteng-Pacdal” or “Plaza-Navy Base”—indicating the city centre and familiar neighbourhoods—painted on their sides. Every once in a while, I’d see a jeepney with the sign “Plaza-Ucab”. Unlike the other cheery and shiny jeeps headed to town with tassels waving from thin poles rising from their headlights, the Ucab jeeps were drab, lacking in ornamentation, and bore traces of dust, sometimes even caked mud, on their tyres and sides. They were always full, and passengers were often from the indigenous groups of the Cordillera Region. Once in a while, you’d see young men standing and holding on to the bars of the jeep’s back door, the straps of their indigenous Sagada weave backpacks flapping in the wind. Baguio is the biggest city in Benguet province within the Cordillera Region, but the indigenous peoples of the Cordillera—collectively referred to as “Igorots” even though they belong to different, distinct ethnic groups—are a minority in the city. The sight of these jeeps full of Igorots from some faraway neighbourhood called Ucab gave me, as a teenager, the feeling that I’d just encountered something foreign and strange. Some of the Ucab jeeps’ passengers would disembark near the gates of my high school. Before the flag ceremony signalling the start of a school day, they stood in groups, dressed in flared jeans and cowboy shirts. One would show off a pair of new cowboy boots to his friend, who’d rib him in heavily-accented Ilocano. My classmates and I, coming from our high school’s elite track segregated from the rest of the school population, listened to Eminem and Britney Spears, and would never be caught dead listening to country music. We stared, mortified, at these teenagers from a distance, wondering how these boys could take such pride in being so uncool. After a few times of waving down the Ucab jeep by mistake, my mother started teasing me about putting me on the Ucab jeep. I bristled at this joke; the Ucab jeeps were always full, and what would the Igorots think if I tried to use the jeep that was obviously meant for them? Like many children of Baguio, I grew up hearing jokes about the Igorot from classmates and old people, and possessed the kind of deep-seated prejudice towards them that takes years of conscious unlearning to shake off. When I asked friends from my high school where Ucab was, they gave me blank stares, as though I had asked them to locate a faraway galaxy. Relatives and my parents’ friends also gave me puzzled looks. They had seen the jeeps, and knew it was nearby, but no one could tell me exactly where it was. It didn’t help that none of my classmates, and none of my parents’ friends, were from there, or knew anyone from there. Ucab, as I learned after the disaster, is actually just a 30-minute jeepney ride from Baguio, and is a village in Itogon, a town southeast of Baguio. It’s one of many villages that sprang up around the mines established by the Americans during their colonisation of the Philippines in the early 20th century. Although Baguio owes much of its growth to the mines surrounding the city, it’s since left behind its mining town roots to become a popular tourist destination for visitors attracted to its cooler temperatures, pine forest parks, golf courses, and American colonial houses. After the big mining corporations scaled back their operations in in the 1980s, the city has since become further removed from the mining villages on its outskirts. There are jobs aplenty in the city, and no need for its inhabitants to find work in such a dangerous industry. But for those living in the hinterlands of the Cordillera regions, mining is still a much-needed source of income. 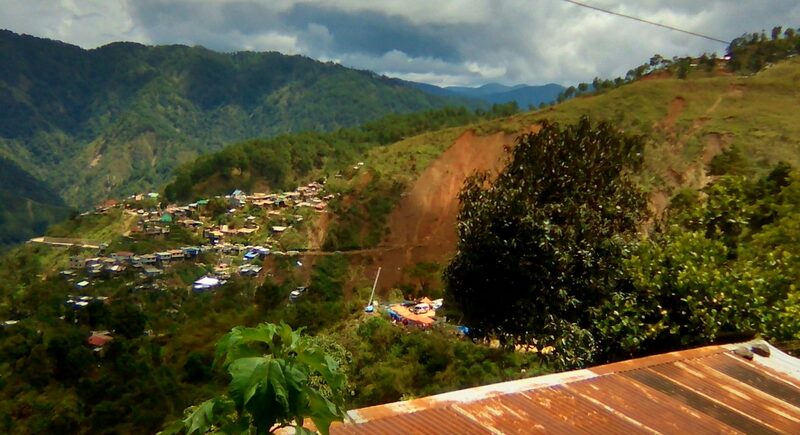 The two buildings in Ucab buried beneath the collapsed mountainside in the aftermath of Mangkhut are bunkhouses owned by Benguet Corporation, a privately-owned mining company, near an old mining tunnel also owned by the company. As of 30 September, the final death toll was at 100; no survivors have been recovered from the disaster site. Although Benguet Corporation, the oldest and largest mining company in the Philippines, has officially ceased its operations in Ucab, it rents out the tunnel and bunkhouses to independent contractors, who employ miners of their own. Most of these miners are Igorots from neighbouring provinces of the Cordillera Region such as Mountain Province, Abra, and Ifugao. According to Leonida Tundagui, an independent researcher who spoke to the miners in Ucab during relief operations, Benguet Corporation collects 40% of all revenue from gold extracted from its abandoned mines. The independent contractors then take a 20% cut, leaving the remaining 40% for the miners to divide between themselves. This arrangement allows Benguet Corporation to collect money from rent and profits without shouldering the responsibility of maintaining the tunnels or providing safety equipment for the miners. It’s a system that’s as rife with exploitation as it is dangerous; many miners have died of asphyxiation and gas poisoning in these “abandoned” tunnels. Since these miners aren’t official employees of Benguet Corporation, the company isn’t liable when accidents, or even deaths, occur. Independent contractors tend to hire and pay people under-the-table, with no official obligation as employers; the miners are basically on their own when they risk their lives underground. Many of those affected by the landslide came from Hingyon in the province of Ifugao. According to Ermie Bahatan, who has roots in the town of Hingyon, men from Ifugao work in the mines to support their families during the fallow period of rice production. Employment opportunities in Ifugao are often limited to farm work, and although government construction projects might offer some men an alternative means of livelihood while waiting for harvest season, many don’t possess the necessary skills. The mines, then, become an attractive, if risky, option. Upon their return to Hingyon, the men, Ermie says, describe work in the mines as difficult and often treacherous. They count themselves lucky if the contractors supply them with equipment and safety gear such as boots, head caps, flashlights, and hammers. Life is tough in Ucab, but with families to feed and few opportunities at home, there’s little choice but to see their contracts through. Local authorities now say that the inhabitants of the affected part of Ucab had been told to evacuate days before Typhoon Mangkhut made landfall, as a crack had been spotted in the mountaintop overlooking the settlement. Baguio and its environs had also experienced a month of non-stop rain ahead of the storm; the soil of the mountains surrounding Ucab was already soft when Mangkhut swept across Luzon. It was a dangerous situation, but many had come from Ifugao seven hours away. With no relatives nearby with whom they could sit out the storm, there was nowhere they could evacuate, aside from the bunkhouses where they took shelter on that fateful afternoon. Following the typhoon, I spoke to two city-dwelling Igorot friends. They said that they, too, hadn’t known where Ucab was until after the storm. One friend, a doctor, had seen patients from the village, but could never point to it on a map. The other kept confusing the Ucab jeeps with Lucnab, a neighbourhood within Baguio’s city limits. To those of us living in Baguio, Ucab felt like a blank spot on the map, a nowhere-land. It took a tragedy like this for us to learn about the farmers from Ifugao toiling away in a mining village just 30 minutes away from where we were. Baguio had been a conduit for the migration that turned farmers into mine workers; they travelled on the main thoroughfares of our city in their dusty little jeeps, but nonetheless remained invisible to us. Right after the landslide, the Department of Environment and Natural Resources issued an order to cease small-scale mining in the Cordillera Region. Those living in or near Ucab complained that they would not survive without mining. Some admitted on television that they’d return to the mines as soon as the dust settled. In response, presidential spokesperson Harry Roque suggested vegetable farming as an alternative means of livelihood for the miners. Vegetable farming is one of the province’s primary industries, but revenues for the farmers are poor as middlemen buy their produce at rock-bottom prices. In the Cordilleras, mining is seen as a more lucrative line of work than vegetable farming, despite the risks involved. Almost a week after the landslide in Ucab, I meet Ester Fianza, a professor of mathematics at Benguet State University. Born and raised in Itogon’s poblacion, Fianza’s familiar with the area. She’d promised to take me to Ucab, and we meet that morning at a Jollibee near the midtown street where jeeps headed for Ucab, and other mining villages in Benguet’s interior, depart from the city. Over burgers and peach mango pies, we talk about how small-scale mining has turned the mountains into blocks of Swiss cheese. “Each company of miners has to pull 200–300 sacks of what they call ‘Nava’ stones from those tunnels every week, from which they extract gold. You can just imagine how many stones they extract from those tunnels in a year, or in a decade,” Fianza says. Later, as we sit in the jeep to Ucab, a pair of elderly ladies wearing colourful Sagada weave jackets stare at me as I speak to Ester in a smattering of Tagalog and English. I can’t speak Ilocano, the de facto lingua franca of the Igorot tribes, and stick out like a sore thumb. “Is it your first time to leave the city to see Benguet?” Ester asks me, with a smile. Perhaps it’s obvious to the people on the jeep, who give me strange looks, that I’m just heading to Ucab because of the landslide. I wonder if my presence is entirely welcome. But it helps that I’m accompanied by Ester, since she serves to ease my welcome into this circle of strangers, who answer my questions in Ilocano. It’s beautiful outside the city: the mountains are covered in pine trees and native bush, and they rise and fall like waves, fading to light green and blue in the distance. The air is cleaner out here; it’s easy to feel that one has just entered paradise. But Fianza points at the mountains that have been hollowed out by tunnels in search of gold, reminding me that this beautiful landscape, rendered unstable by decades of mining, can also kill. As we walk down the narrow, dusty main street, I spot several churches and signs hanging from windows and door frames bearing the words “God is good” and “Jesus saves”. I see a little boy by the road with a T-shirt that reads, “God is awesome”. Before my visit, I’d been taken aback by the fervent religiosity displayed by those featured in TV reports talking about their lost friends and loved ones: when interviewed, they said that although it hurt to lose a loved one, it was all part of God’s plan. But after listening to Ester talk about houses sitting on hollow ground, I wonder about whether I, too, would want to put all my faith in a benevolent God if I lived in such a precarious place. The landslide had headed straight towards two bunkhouses right beside Benguet Corporation’s tunnel, missing other houses in its path. One building had been full of miners and their families who had evacuated from their homes at the height of the storm; they’d believed that the bunkhouse, normally used as an evacuation area during storms, would be the safest spot. The other bunkhouse was a converted chapel, where families and young musicians had gathered to practice for the next day’s mass. Aside from the very few who were able to run just as the mountainside collapsed upon these buildings, all of those who were unable to escape, currently numbered at 100, perished in the landslide. We find a spot where we can get a good view of the landslide, stepping onto a concrete platform by the side of the road. It’s much bigger than I’d imagined from the pictures in the media: an entire mountainside gone. Orange tents have been erected on a hill below us, with a whiteboard bearing the names of those still missing. Further downhill, policemen in blue shirts, and miners wearing hardhats and the orange uniform of the Philex Mining Corporation mill about another tent. Both groups, I’m told, have volunteered to retrieve bodies from the rubble, and to rescue survivors, if any are found. Reading the news, I’d imagined the bunkhouses to be at the foot of the mountain, and wondered why people would have thought them to be a safe refuge. But the bunkhouses hadn’t actually been on the mountainside at all; a villager points out that they were some distance away. It was a series of unfortunate events: while the landslide missed houses that still clung precariously to the mountainside, it found the bunkhouses. There’d been a smaller landslide near the bunkhouses, the villager says, and they both met at the very point where people believed themselves safe. Two helicopters emerged from behind the mountaintops of the next village, filling the air with their threatening hum. “Looks like they found someone,” Ester said, pointing at a man below us. It took me some time to find him, but there he was, frantically waving a white handkerchief. We decide to head back to the city when it starts to drizzle. We board the jeep and sit across from a woman who smiles, and introduces herself as a member of one of Ucab’s original families. She tells Ester that another old mining tunnel had collapsed near her house. Ester tells her about the German engineer’s comments; the woman smiles, as if she’s just being polite, just as two men in worn, cuffed jeans grab on to the railings of the jeep’s entrance, planting their mud-caked sandals onto the platforms flanking the door. They cling on as the jeep makes its steady climb up the zigzagging highway, past the achingly beautiful scenery and bald spots left by landslides. They hold on until we reach the city limits, upon which they climb inside. The evening before I visited Ucab with Ester, Ermie texted me to say that she’d be at the disaster site to accompany people from her village as they wait for the remains of their relatives to be recovered from the rubble. The Ifugao believe that their dead must be buried near their ancestors or their spirits will hound their families, forever restless until their remains have been brought home. This made me think of my own late father, buried in Baguio far from his hometown of Zamboanga in the southern island of Mindanao. He’d made Baguio his home since the early 1980s, but his stories always drifted back to the city of his childhood. Memory, like one’s spirit, will always seek its home, even when our bodies carry us to faraway places. 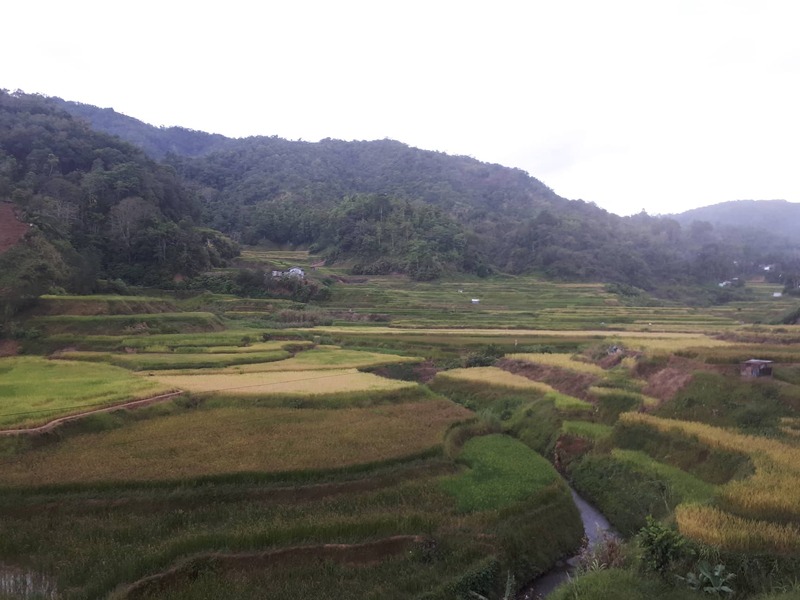 Ermie sent me the photos she had of Hingyon, pictures of terraced hills planted with rice, mountaintops blanketed in fog, and rice stalks turning golden in the sun, ready for harvesting. I can imagine how the spirits of the dead would want to return to this place: in pictures, it’s beautiful and quiet, far away from the tumult of a mountainside that buried people alive. Their relatives made the seven-hour trip from Ifugao to retrieve their remains, hoping to give them a proper burial in the land of their birth. Perhaps the dead, who had made a long journey to work in dangerous mines, can find some comfort in their loved ones coming for them and bringing them home. My grandparents were betting on the promise of a better life when they moved their family from a lowland barrio in the Ilocos Region to a new and booming city in the Cordilleras. They wanted more opportunities for their children, and there were definitely more jobs and better schools in Baguio. But if one is a new arrival with few connections, one’s success depends, to a huge extent, on luck. My grandparents worked hard and earned their success, but in many ways they were lucky, too: my grandfather chose the right business, met good people, and found a vacant lot in a good part of town when land was still cheap. They took a leap of faith like many others; while it worked out for them, others haven’t been as lucky. When one is removed, perhaps by geography and several generations, from poverty, it’s hard to remember how the poor have far fewer choices. Our ancestors were the ones who made leaps of faith to break the cycle of intergenerational poverty. We forget that others are doing the exact same thing in right now, right on our doorstep: men, sometimes entire families, uprooting themselves from small towns in the Cordilleras to find better work in the mines near Baguio. Considering the limited options they have, it’s a gamble they’re willing to take, even if it could cost them their lives. Alcantara, Erlyn Ruth E. “Baguio Between Two Wars: The Creation and Destruction of a Summer Capital.” Vestiges of War: The Philippine-American War and the Aftermath of an Imperial Dream. Ed. Angel Velasco Shaw and Luis H. Francia. New York: NYU Press, 2002. 207-223. Print. Dacanay, Santos Jose III. 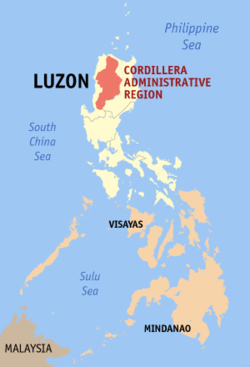 “Public Finance and the Challenges of Autonomy: The Case of the Cordillera Administrative Region.” Cordillera Review 2.2 (2010): 43-75. Print. Monica Macansantos was a James A. Michener Fellow in Writing at the University of Texas at Austin, where she earned her MFA, and also holds a PhD in Creative Writing from the Victoria University of Wellington. She has recently completed a short story collection and a novel, both of which are mostly set in her hometown of Baguio. Her work has recently appeared in SBS Life, Women's Studies Quarterly, Takahe, and Aotearotica, among other places. Her essay, "Becoming A Writer: The Silences We Write Against", was named Notable in The Best American Essays 2016. Learn more about her work at monicamacansantos.com or on Twitter @missmacansantos.